Moving to Sunnyvale is something a number of people do every year.This article is intended for those who are thinking of doing so, we did the research and compiled some information for you. This small to medium-sized city has a population of about 140,000. It is clean and modern in the sense that most of the buildings, homes and apt. buildings are fairly new. It is a diverse city in that there are about 43% Whites and 40% Asians, but not very many African-Americans. Most of the rest are Hispanics or other races/ethnicities. The median home value is $1.4 million and the average rent is about $2100. A 3-bedroom single-family home might cost $1.6 million in Sunnyvale, though there are also some mobile home parks where you might find something for $300,000. There are also some condos in Sunnyvale in the range of about $600,000 and up. For rentals, you might find a studio apartment for $1,000 or more, and a 1-bedroom for $1600. Of course, if you shared an apartment or rented a room in someone’s home, you might find something more affordable. Moving to Sunnyvale might be challenging financially if you don’t have a fairly sizeable income, but many people who move there are doing so to work in technology, so they will be able to afford it. Summer temperatures can reach over 100 degrees, but that is rare. Winter temperatures during the day can dip into the 50s, but typically they don’t go below that. During other seasons, the temperatures range between those two points. Sunnyvale is also fairly dry, with rain occurring during winter and some in fall. Humidity is generally low throughout the year. The public schools in Sunnyvale are rated 8/10 according to Great Schools, so if you have children they could do well in them. For adults, DeAnza College is nearby in Cupertino on Wolf Road, and Foothill College is a little further away in Los Altos. Santa Clara University is several miles away in Santa Clara, and San Jose State is about 10 miles east and south. When we are thinking of moving to a new place, one thing we want to know is if living in the new place will be disappointing. Moving to Sunnyvale is not likely to disappoint anyone, unless perhaps you are used to being in New York City, with its very rich cultural offerings. However, it would be very unrealistic to expect Sunnyvale to have the same kind of culture as NYC, or even LA. Sunnyvale is rather calm compared with just about anyone of the largest American cities, and it is more of a worker and family-oriented atmosphere. Sunnyvale has thousands of tech workers and many work more than forty hours a week; they also tend to be well-paid, so they eat out frequently. In the ‘downtown’ section of Sunnyvale, near Murphy Avenue, there are a number of restaurants and shops. This area has buildings that are not particularly tall, which are older, integrated with some newer ones that are several stories high. Also, across one street from there a more conventional shopping mall provides the kind of shopping experience one might expect, with some chain stores like Macy’s. 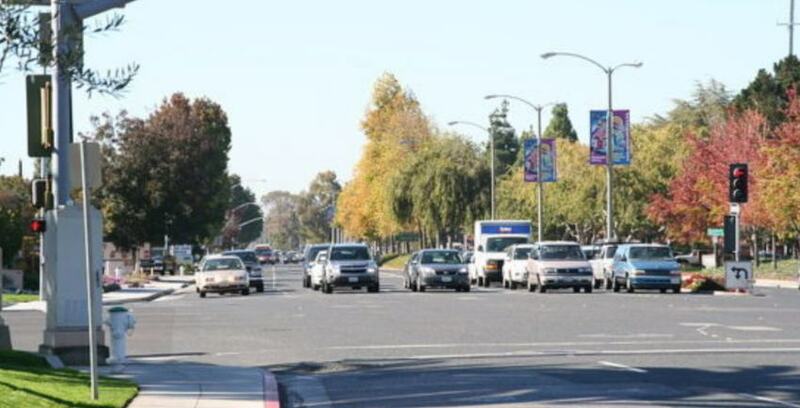 There are also sections of Sunnyvale with strip mall shopping, especially along El Camino Real as you go East toward Santa Clara and West toward Mountain View. In some of these areas you will find places like Borders Books and P.F. Chang’s. You will also find more internationally-oriented restaurants and grocery stores. Moving to Sunnyvale is probably going to appeal to tech workers and families who want a safe, clean medium-sized city. Ortega is located at 636 Harrow Way Sunnyvale, CA 94087. Sunnyvale Golfland has miniature golf, at 855 E El Camino Real, Sunnyvale, CA 94087. Sunnyvale Municipal Golf Course is 6,255 yard, has 18 holes and a rating of 70. It is located at 605 Macara Ave, Sunnyvale, California 94086, Santa Clara County. staged. The address is 753 E El Camino Real Sunnyvale, CA 94087. Another theatre is located in the Sunnyvale Community Center area. Also, there may be two additions to the downtown part of Sunnyvale: a Whole Foods and a cineplex, which both may be operational by 2019. Currently, you can go to nearby Cupertino for movies and to shop at a very large Whole Foods store. Are there gyms in Sunnyvale? There are over 15 gyms or fitness centers there, and a big gym with at least two basketball courts at the Sunnyvale Community Center, which is next to the heritage gardens at 550 E. Remington Drive. Is there yoga in Sunnyvale? There are about 7 yoga studios or other places that offer yoga. What is Sunnyvale known for? Sunnyvale is noted for having a low crime rate and good public services like parks and libraries.The main reason a person may think about moving to Sunnyvale would be to work at one of the tech companies or to move out of one of the towns near by like Los Altos, Palo Alto or Menlo Park that are more expensive. Moving to Sunnyvale might be a good choice for someone who wants to be near all the tech companies, but is also seeking less urban density than one finds in San Jose or San Francisco. Amitabha Buddhist Society of USA. So, moving to Sunnyvale will not prohibit anyone from maintaining a religious connection. Yes, StoragePRO manages a storage facility in Sunnyvale which provides clean, secure storage.